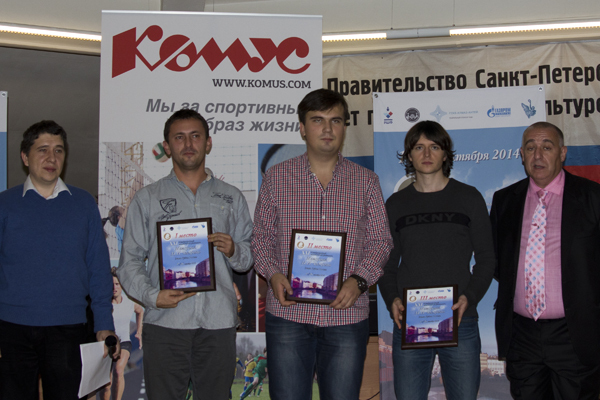 The International Chess Festival “Mikhail Chigorin Memorial” 2014 was held on 17-26th October 2014 at Hotel “Park” in Saint Petersburg, the second largest city in Russia. The 9-round Swiss event with prize fund in the amount of 1.800.000 RUB (nearly 35.000 €) was won by Serbian Olympic representative GM Ivan Ivanisevic with 7.5/9 points. Russian GM Ivan Bukavshin obtained the same amount of points but had a worse Bucholz score and took the silver. Third place was shared in an eight-way tie by GM Maxim Rodshtein (Israel), GM S.P. Sethuraman (India), GM Sanan Sjugirov (Russia), GM Evgeny Alekseev (Russia), GM Surya Ganguly (India), GM Vasily Yemelin (Russia), GM Evgeny Levin and GM Pavel Ponkratov on 7 points each. You can see the full standings on the list below.